L'Artisan Parfumeur will launch Côte d’Amour in May. The new perfume has been certified natural by Ecocert, and follows 2007's L'Eau de Jatamansi, the brand's first foray into the natural perfume market. 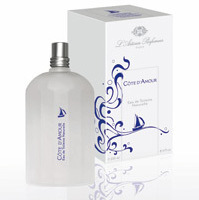 Côte d’Amour is a salty aquatic fragrance developed by perfumer Celine Ellena, and features notes of green tangerine, pink grapefruit, rosemary, dune immortal flower, cypress, gorse blossom, rose, broom, heather and maritime pine. A trip along the Loire Atlantique coast was the inspiration of Côte d’Amour, an Eau de Toilette to delight the senses: a soft caress of sea air and sand, of scents of golden yellow gorse, heather and broom, a sensual mixture of soft resin and floatwood … Reminiscent of building sandcastles, shell collecting along the beach and riding your bike against the wind. It reminds us of the memories of childhood and Holidays alongside lazy, relaxing afternoons. Its salty note, that wonderful marine odor at the heart of this eau de toilette, gives the fragrance all its personality. Glad I re-read…the first time I went through those notes, I thought the last one was “maritime pie.” Maybe I should swap my tea for coffee…. What’s with these humungous bottles again?! I am still coming to terms with the demise of Dzing! in a 50ml size, just as I was moving tentatively towards a purchase…Perhaps this is the perfume deity’s way of keeping me on the straight and narrow – or the straighter and narrower than I would be otherwise! If it is like Jatamansi, it will be very light — like a body mist — and you could conceivably need a lot of it! But adding — yeah, I’d rather have smaller bottles too. If it’s like Jatamansi, make that a big spray decant! Jatamansi was really a pretty airy scent. Hi Flittersniffer, F.Y.I., I just saw a 50 ml size of Dzing on Four Seasons Products. Drat. But I will say that I got 100ml of Dzing! on ebay (tester w/o cap) for less than the regular retail price of 50ml, so I’m not sorry…. Flitter: I finally gave up on looking for 50ml bottles of Dzing! on ebay and such, so I had to cave in and buy 100ml. Maybe I’ll sell off some decants or something… but 250ml is just WAY. TOO. BIG. and possibly the only use for a bottle that large is splitting. Oh, no!!! L’Artisan? Salty aquatic? Tangerine? Immortelle? Broom? Celine Ellena??? Just when I thought my spending urges were relatively under control, my favorite house comes out with a summer fragrance with my name on it. Seemingly. I may have to buy Jatamansi and this one and make my move back to Hawai’i, or somewhere else with an eternal summer. This could be really nice…I liked what CE did w/ saltwater in Sel de Vetiver, although it isn’t really one of my favorite scents. Sel de Vetiver IS one of my favorites, so of course this one intrigues me! Ohh, this sounds like it might be a nice out-doorsey type of scent. I wonder about the staying power is like. The marine notes sound ok, but I have no idea what gorse blossom smells like? Have to wiki it. I love this kind of scents. Jatamansi was very nice. I have to get a sample of both. By the way, this is my first comment here. Greetings from Spain! This sounds wonderful. The salty aquatic part with citrus seems incredibly refreshing. can’t wait to try this. oh never mind, there it is! Yes, Daisy, it is. I love to eat them, wear them, cook with them; when I say them I am referring to the milk, water, jelly and flesh. I like your gravatar, too! Hey – and don’t forget the coconut oil and how good it is for your skin. then I suppose you are familiar with Hilde Soliani Sipario? It is a coconutty dream…..unless when you said ‘wear them’ you meant one of those Little Mermaid bikini tops. Well, you go, girl but save it for warmer weather! I’m always up for trying a new L’Artisan scent, but I still haven’t tried Jatamansi (or Liane). I guess it’s nice that they’re making a foray into “natural” perfumery (or their version of it). This really sounds like it could be very nice, and that packaging is really nice. Interesting that Celine Ellena is the nose — haven’t heard much news from The Different Company lately. I guess that Sublime Balkiss is relatively new, but I wonder how they’re doing. Ahhhh, great stuff on the organic alley, which is completely mine! But organic perfumes habe been until now just blah, and I am a stringent user of organic cosmetics. JATAMANSI is nice but too much a cologne and really weak, even splashed I think. Still, this one might be nicer, I do not give up and look forward to it. it’s a really bad idea to buy fragrances from ebay, they could be off, or left out in the sun. i didnt like jatamansi too much but cote d’amour sounds amazing!! have to get it. gorse is an amzing scent! it reminds of my childhood. when i used to visit the peak district in summer which is where HUGE amounts of gorse blooms!! its a spikey plant with pretty little flowers. I buy from ebay all the time. Important to bear in mind that when you buy from a “real” store, you aren’t necessarily getting fresh product either. I liked Jatamansi, and still have only tried the Cote d’Amour once, but think I liked Jatamansi better…we’ll see how it stands up on later testings! Haven’t seen any announcements that this is out yet. I’m eager to try it! I haven’t seen any either. I do have a sample…it’s nice, but I don’t love it as much as Jatamansi. I might try to review it in a week or so. Hi, new on this blog. I was surprised to see those comments about the “Artisan Parfumeur”. I am using these products since 1977, (around). I’m not a grand mother for the moment… lol I’m always curious to smell the new frangances. I like Jatamansi. Premer Figuier for summer its nice. A long time ago was a nice one it was Pomme Canelle…. Tomorrow going to a big City and i will smell “Côte d’Amour”.